The verdict has been in for some time for a lot of shows, but this week brought about a spate of surprising (and not so surprising) cancellations. 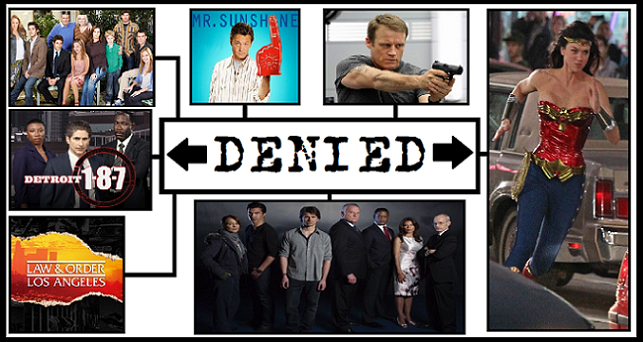 It’s not surprising to see a lot of these shows on the chopping block. Across the board, this was one of the weakest television seasons of the last ten years. But quality doesn’t seem to be the sole reason for cancellation. Mr. Sunshine, the Chicago Code and Lie to Me were solid, if unspectacular, shows that were well-written and full of decent performances. Unfortunately they just couldn’t beat crap like Hawaii Five-O, which actually pulls down very solid numbers. But the majority of the programs on this list were just plain terrible. Outsourced? Mad Love? Running Wilde? Law & Order: LA? This is a veritable cornucopia of horrible television. I went on record earlier this season in saying that L&O: LA was a major disappointment. It was a pale imitation of everything that made the original Law & Order, and subsequent spinoffs, fun and engaging television. But if broadcast television is still full of garbage, what does that mean? Well, it’s obvious that America loves trash. Jersey Shore does monster numbers in the ratings while Fringe teeters on the edge of cancellation. FYI, Fringe was picked up for a fourth season; so rest easy, fellow nerds. It’s obvious that the viewing tastes of the nation are in the toilet but, more importantly, it’s been widely acknowledged that the ratings system is flawed. Broadcast television is still beholden to the antiquated Nielsen Ratings system and fails to adequately acknowledge digital downloads and online streaming. Even after finding ways to monetize content from the internet, the networks still cling to an old and severely outdated system. But it doesn’t matter, because there is no way that we can affect any change. Watch your shows. Just don’t get too attached to them. Here is the rundown as of 5/15. Rest in Peace. On the other side of the dead list are the shows that didn’t get picked up for the 2011-2012 season. Chief among them (for me anyway) are Wonder Woman and Precinct 17. I was following the development of each show for very different reasons and was surprised that both failed to get a pick-up for the upcoming season. Wonder Woman not getting picked up is a positive thing…for all of us. Aside from having TV writing god, David E. Kelley, on board ; this series radiated an aura of bad television. Adrianne Palicki being cast as WW was the first sign of a misunderstanding of the property. Filling the supporting cast with the likes of Justin Bruening and Elizabeth Hurley continued the spiral towards the land of mediocre viewing. Upon seeing the costume design for the show and Palicki in action as Wonder Woman, it was obvious that this show was destined to NOT get a season pick-up. Be thankful for all of this. Very, very thankful. Precint 17 was the brainchild of Battlestar Galactica mastermind, Ronald D. Moore. It was described as a police procedural set in a fantasy world. Think of a magical version of Fringe or, for the Harry Potter set, Aurors: The Series. It would have reunited Moore with former BSG vets Jamie ‘Lee Adama’ Bamber, Tricia ‘Six’ Helfer and James ‘Gaius Baltar’ Callis. Toss in Kristen Kreuk of Smallville fame and you have quite an interesting series. Unfortunately, the networks weren’t impressed with the pilot and the project was killed. No BSG reunion and no magic cops. Alas, I should be thankful I still have Fringe to watch.